I somehow managed to miss Doctor Who #14 last month and didn't realize it until I saw #15 in the shop this past weekend. Thankfully, the matter was easily rectified and I was able to get caught up on what happened after what was - if memory serves me correctly - a most enjoyable set-up. Tony Lee depicts Smith's Doctor as a delightfully dorky man-of-action. 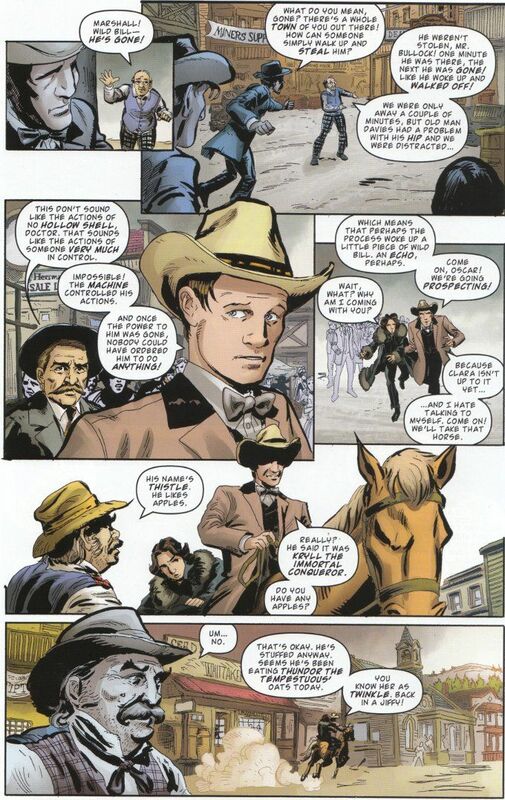 Things go a bit far in one scene where The Doctor ponders whether or not he prefers being ignored or having people try to kill him but for the most part Lee perfectly captures Smith's manic energy. Indeed, the only major flaw with Lee's script is that he may be trying to do too much with this story. Teaming The Doctor with one historical figure would be story enough. Here he is teamed with four of them, ignoring the people of Deadwood itself! There are also multiple villains in play but the readers are unlikely to complain even when the historical bits get a bit cumbersome. 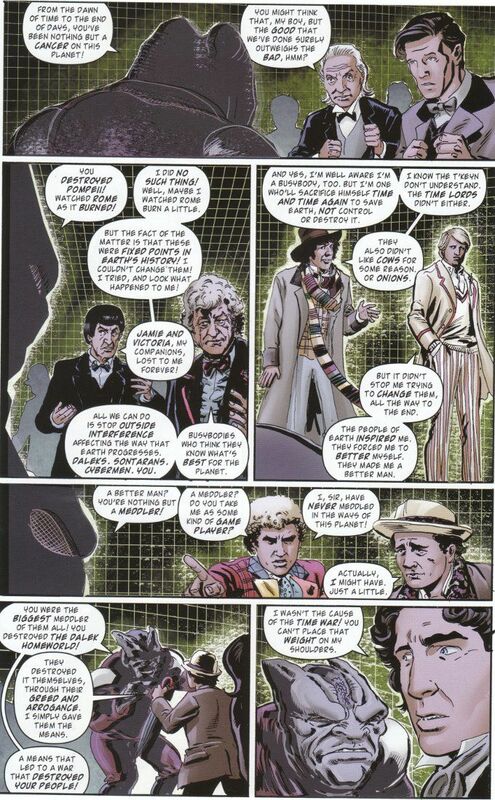 The best sequence of the book, bar none, involves all the incarnations of The Doctor getting involved in a psychic legal defense of The Doctor's life. Mike Collins' artwork is oddly uneven in both issues. He fares well enough in the close-ups and does a decent enough job depicting the various Doctors as well as the historical figures involved. Yet some panels are over-inked and Collins' artwork loses all detail in the middle and far distance. This leads to some oddities and inconsistencies in the artwork but nothing that distracts overly much from the final package.